Can you believe Christmas is this week?! It always sneaks up on me. I wish I was more prepared with everything- I mean- I still have some Christmas Shopping to do! Some people are SO on top of things and I admire you so much for that. I don’t know what my deal is but every year I say I am going to have all my plans and check lists completed long before the day to avoid the crazy chaos at the stores and on the roads, but somehow, I always get caught in the thick of it. One thing that doesn’t sneak up on me is the holiday baking. Probably mostly because of this blog, but also because I LOVE being in my kitchen and creating and giving goodies to my friends and family. One thing I recently made were these Almond Joy Brownies. 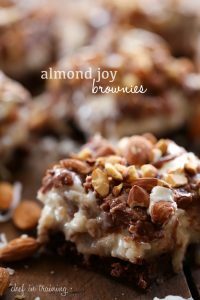 These Almond Joy Brownies are ridiculous, in the best way possible. They are over the top rich, indulgent and decadent! With Layers of fudgy brownie, coconut filling, chocolate frosting and almonds- how could you ever go wrong? There is still time to whip up a batch of these bad boys just in time for the holidays- so if one of more of these layers speaks to you, I highly suggest you do! You will not regret it! Cream butter and sugar together in a large mixing bowl. Add vanilla and eggs and mix well. Add salt, cocoa powder and flour and stir to well combine. Do not over mix. Pour into a greased 9x13 inch pan. Bake at 350 degrees F for 22-25 minutes. In a medium sauce pan, bring evaporated milk and sugar to a boil. Reduce heat to low and stir in marshmallows until melted and smooth. Remove from heat and stir in coconut. Spread over cooked and mostly cooled brownies. Set aside. In a medium sauce pan, combine sugar, evaporated milk and butter and cook over medium heat until sugar is dissolved, stirring constantly. Once sugar is melted, remove from heat and stir in milk chocolate chips. Drizzle over cooled coconut filling. Sprinkle toasted almonds over the top of frosting. I am NOT ready for Christmas. I just want to sit back, watch the snow and eat some of these brownies.